Since the launch of the version 4 back in August, the new Digg has been getting minor over-hauls time and again. One of the main reasons of the frequent changes is to bring back the user experience to the Digg community. Even though, the team at Digg did many mistakes which resulted in losing user-base, I still credit them a lot for the amount of efforts they are putting in to bring the community back. They have been adding features ranging from upcoming to bury button, everything has been added as per the user request. They have also been tweaking up the design since then. When I logged onto Digg today, I found an invitation to view the new design. Clicking on that, I realized, the new design is even simpler. Two of the things I loved about Digg v4 when it launched were the simplicity of design and speed of the site, but that at the cost of cutting almost all the features. Digg v4, however, after 6 months, looks very promising. It has all the features that diggers need, a better design than v3, faster to browse, lesser errors and an over-all better user-experience. 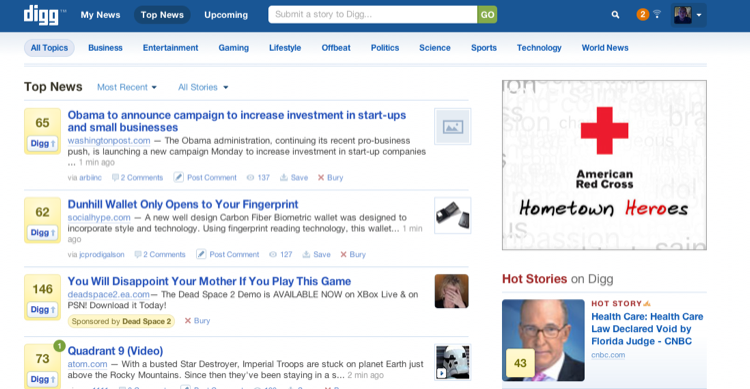 The new design is only rolled out yet to 15 percent Digg users and will be soon rolled out to everyone else. This new design includes a new way to browse between the different sections of the site and an easier way to filter your content. We’ve simplified the design to make stories more prominent and easier to read. The newly organized profile page makes it a snap to see all your statistics. And last but not least, a new submission flow makes submitting stories easier. We couldn’t wait any longer to share these with our users and gather feedback before a public rollout, but there’s still a lot of work to be done. Even though the design has been built on the user feedback, Digg still allows you to switch between the designs. Apart from the re-design, Digg has finally been able to import all the user-stats from v3, which took much longer than expected.